Is This Worth around 300 Dollars? QUESTION: Are Folded (2000?) Damascus Blades by Shinwa worth Buying? I want to be a serious buyer of functional swords. This is a Tool that should never perish. Folded swords are not necessary these days (it was a technique done to try and minimize impurities in the steel, which is a mute point for modern steel) and indeed, for swords at this price point, they actually tend to create more problems when folded, including air pockets and weld flaws. 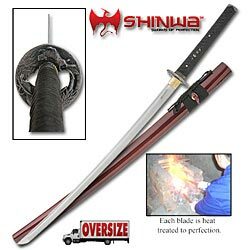 I'm not a big fan of Shinwa per se, but I would recommend having a good look over the reviews and info on my Japanese swords page to find something that best suits your requirements. The Japanese have nine different technique's for making sword blades only one that I know of folds steel otherwise most technique's combine different hardness of steel for various purposes. With that said if you take 1045 carbon steel and fold it to acquire 2,000 layers the steel will be stronger than the unfolded 1045. Thank you Daniel of Nebraska.